There are basically two ways to monetize a blog or website. One is to depend upon Google to make money (AdSense, selling banner ads, paid reviews, etc.) and the other is to grow your readership (using your blog or an email list). You never know when Google will penalize your site costing you traffic and sales. On the other hand, if you build your list, you have unlimited ways to make money. Did you know that over 80% of the income made by top bloggers and marketers comes from their email list? Did you also know that Capterra found that every dollar spent on email marketing resulted in $44.25 of revenue? That’s a whopping ROI, right? Simply put: money is REALLY in the list. Email list is just like a money making machine. The more value you add to your list, the more money it generates for you. It doesn’t matter whether you are building a blog for making money or increase your online influence; email list is a goldmine. So how to build and grow your email list? You simply can’t use RSS feeds to grow your subscribers. Gone are the days where people used RSS feeds to increase their subscribers. You really can’t do anything with such feeds. You NEED to start using email marketing software to grow your email list. Only then you will be able to send email newsletters, promotional emails and sales pitches to grow your income using your email list. Picking the best software for building your list is a lot of pain because there are over 250 email marketing software solutions on the web right now! If you are wondering about using the RIGHT email marketing software to build your list, let me help you. I’ll be compiling a list of all the incredible email marketing software you can use to grow your list. Go through them one by one and decide by yourself the right one that suits your blogging needs. Before sharing the list of all the best email marketing tools to grow your list, let me first tell you which one I personally use. The reason I’m doing this because I want to let you know more about the email marketing software that I’ve been using for a long time now. I can explain you better about the products I use so you can decide whether it’s a good fit for you or not. The email marketing service I use is GetResponse! Why I use GetResponse and why you should too? Let me explain about all of these 3 features that you can easily do with GetResponse. 1. Building an email list with GetResponse: Building an email list with GetResponse is extremely easy. Not only you can add signup forms wherever you want on your blog with their pre-designed email opt-in forms, but you can send emails automatically. You can broadcast all your emails to the people who sign up to your list whenever you want. Even if you are not a tech savvy, you will find it easy to send newsletters with GetResponse. Have a look at their dashboard once and you will know why. You can easily add contacts from your Gmail/Yahoo account, and Facebook accounts using their “Add Contacts” feature. You can create forms and showcase them on your site with their “Create Form” section, and you can easily send newsletters with just one click from their dashboard. 2. Creating webinars: Did you know webinars convert really well? Most successful online marketers like Derek Halpern, Pat Flynn, Jon Morrow frequently use webinars to grow their influence. Not only webinars help you quickly boost your email list, but they give you highest conversion rates when you recommend a product or service. With GetResponse PRO account, you can run and promote unlimited monthly webinars up to 100 attendees each. 3. Creating landing pages with GetResponse landing page builder: GetResponse offers so many landing page templates ranging from sales pages to video pages to webinar pages. There are over 200 pre-designed landing pages which help you increase your online influence and conversions. What I like about creating landing pages with GetResponse is that it's a drag and drop method. You can change everything from font size to color to images that are included in the pre-designed landing pages to suit your needs. As I said earlier, I use GetResponse to grow my email list. Here are few more reasons that persuaded me to pick GetResponse over the others. • Incredible autoresponders: The #1 reason for anyone to start building a list is to send email newsletters. You need "autoresponders" to automate your communications to your email subscribers so you can save a lot of time. When it comes to autoresponders, GetResponse is the industry leader. They have an email deliverability rate which stands at 99%. • Split testing: A/B testing or split testing is a must these days. It allows you to try out various versions of your email newsletters and tell you which one is performing better so you will have a clear idea of what's working and what's not. Quick note: GetResponse allows you split test up to 5 variations whereas AWeber allows you to do 4 variations and MailChimp allows just 3. • Pricing: Up to 1,000 email subscribers, the cost is just $15 per month with GetResponse. And the best part is that you don’t have to enter your credit card information if you want to give a try to their 30 days free trial version. You can build a list up to 250 subscribers with their free account. You can send unlimited emails as well as promotional sales letters. What are the pros of using GetResponse? Split testing feature of GetResponse is just amazing. It lets you create 5 variations with your emails, more than any other email newsletter service. Email open rates will be high with GetResponse. The email deliverability rate is more than 99%. It sends responsive email newsletters. It means, people who use smartphones to read your emails will NOT face any issues reading your stuff. 500 stunning pre-designed email templates ranging from education to eCommerce to real estate. FREE trial of 30 days. No credit card information is required. Such a generous deal! The user interface can be updated and become more cleaner to compete with AWeber, MailChimp, which has much better interfaces. Try GetResponse FREE for 30 days! Although GetResponse is definitely one of the best email marketing tools for marketers, there are also other great tools that offer exceptional features to build and grow your email list. This page is created for you just to provide you a wide range of tools to build your list. ConstantContact is another great choice which is widely used by small business owners who want all the things at one place such as feedback forms, doing surveys, event registration pages, etc. They offer you 60 days free trial account (no credit card required). And you can get FULL access to their marketing tools. Their pricing starts at $20 per month which you can use to build an email list up to 500 subscribers. What are the benefits of ConstantContact? Drag and drop template design make it easy for you to create professional looking emails with ease. Editing your emails and customizing them with any design you want is as simple as dragging and dropping. Personalization of emails is what makes ConstantContact an incredible email marketing software. For instance, if you create a personalized and friendly email to send to a customer/friend/reader, it automatically sends an email on their birthday or any other special day which you have created already. You can have free access to their gallery of stock photos and use them in your email templates whenever you need. They also have both Facebook and Instagram integration which makes it easy to build a new audience from social media sites. Pricing is bit high when compared to others like GetResponse or AWeber although the features are almost the same. Doesn't offer a wide range of integrations. ActiveCampaign was launched in 2003 and offering email marketing services since then. They are industry leaders in providing intelligence driven marketing solutions at an affordable price tag. Their pricing plan starts at $9 per month, and you can use it to build a list of 500 subscribers. Why should you go with Active Campaign? One of the best things about using ActiveCampaign is that you can see full information about anyone who is in your email list. You can easily find out when a person has opened your email, replied to you or pages visited, etc. This helps you better understand about your email subscribers and what to send to them to get better conversions. You can easily build automated email campaigns to different segments of your list. Last but not least, their pricing is unbeatable. At just $9 per month, you can build a list up to 500 contacts. Their drag and drop builder to create emails is noted as one of their major cons. Segmenting your email reports is quite hard with their interface. iContact was started in 2003 and offering email marketing solutions for all kinds of budget since then. iContact is represented by a leading global media intelligence company called Cision which has 100,000 customers around the globe. Their pricing starts at $14 per month which allows you to build a list up to 500 subscribers. Loads of beautifully crafted email templates which are easy to use. iContact provides an incredible tracking and reporting which stands #1 in the email marketing field. They also offer a robust social media integration which you can use to integrate your social media accounts and activities with ease (through your emails or custom surveys). They offer campaign tracking, responsive email templates, autoresponder and A/B testing to make your email list building easy to use. iContact doesn't have powerful API integrations when compared to other services such as AWeber, GetResponse or MailChimp. The majority of the BIG players in the marketing world use AWeber to manage their email lists. AWeber allows you to easily customize your email templates and provides excellent email deliverability rate of 99.34%. Just like GetResponse and other email marketing solutions, AWeber also has flexible pricing options which vary as below. Start your 30 days free trial wit​​h AWeber! AWeber’s email templates look gorgeous. Better than any other email marketing solution. AWeber allows you to perform split testing on each email up to 4 variations. Widely used by the Internet marketing experts. The price is a bit con when compared to others, especially GetResponse. No webinar option unlike GetResponse. MailChimp is incredible and widely used email marketing service. MailChimp is a free email marketing software that allows you to create a list of up to 2,000 email subscribers. MailChimp has a free plan where you can send up to 12,000 emails/month to up to 2,000 email subscribers. You can use your own HTML email design or use their pre-designed email templates. Their interface is easy to use. It’s very minimalistic and easily can be used even by non-tech savvy. Their emails can be easily labeled as spam due to their ability to add almost anyone to their list. You can’t send promotional emails using their free plan. Duh? No affiliate​​ links mean no money! You can’t automate your newsletters with their free account. Which one should you pick in terms of ease of use? We have talked about 5 different email marketing solutions in this post and picking one or two among them is tough. Let me be honest - all of them are excellent concerning automation, split testing, pricing factor, etc. If you are concerned about managing your email lists with the "easy of use", GetResponse wins the race. It's not only affordable (just $15 per month) but helps you create stunning landing pages and allows you to host your webinars without costing you anything extra. If you are searching for a free option, then MailChimp is the one you should try. It's free up to 2,000 subscribers, and you can send automated emails to your list. Although it costs you more when compared to the other services like GetResponse, AWeber once you reach your 2000 subscribers count but it's a great start if you are searching for something free. Both GetResponse and MailChimp are my favorites when it comes to building and growing an email list. So do let me know which email marketing software you are going to try. Is it GetResponse or MailC​​himp or any other? If you have any questions before trying them out, let me know in the comments, and I’d be glad to respond to all your queries. If you enjoyed reading this article, kindly give it a share. Your share is extremely helpful to spread our message and help more bloggers like you. Hi, I'm Ankit Singla Founder of Master Blogging. A blog that helps you master the art of Blogging. Join our Facebook Community and stay connected with other like-minded bloggers. Thanks For Writing Such Useful Posts Buddy! Mailchimp is a great GetResponse alternative. According to my needs, I decided to go with GetResponse. If you build your own list it will help you to increase your readership too. By just a single email, you can drive TARGETED traffic to your newly published articles. I have been using MailChimp for years, it’s really an amazing tool. I haven’t tried the other tools, so think I will give a try. No doubt, MailChimp is one of the top email marketing services but the only pitfall is you can’t send promotional emails using their free plan. Are you using their free plan or the paid one? I never go for paid thing, Although i have used the paid services of MailChimp for one of my clients. Free stuff are great and we all like them but you can’t always depend on the free stuff. Thanks for sharing these E-mail marketing software. I am going to choose MailChimp, and I have been using it for the last year! Thanks for expanding my know-how about these software. Have a beautiful journey ahead! BTW, I just checked your blog and found you are using Lightbox to build your email list. May I know, how much conversion rate you are getting with lightbox and are you doing A/B split testing to further improve that? Yes, for sure I do A/B testing, it helps a lot. Thanks for sparing time to check my blog! 49% conversion rate is HUGE. I would love to know how exactly you did it? I’m getting only 5% conversion rate and I perform split testing on regular basis. You might have some suggestions/tips for me to improve it. Actually, I am getting fresh visits that are well-targeted. I am using Adwords and getting awesome results! That’s a game changer, Muhammad. Have you ever tried facebook ads? As per my experience, it’s much better than Google ads because of so much targeting options. Do let me know your views. Yes, Facebook ads are far better. I’ve not used it for peronal usage. But, I created some campaigns for my clients, they all are happy as they get good conversion rate. One of the best thing about facebook ads is we can make our Website custom audience (WCA) and use that to promote our landing pages. Because that audience already knows your blog/brand, the chances of getting conversions is super HIGH. Just signed up at mailchimp & got your this article in my inbox. While reading, noticed that mailchimp is the only provider, who offer FREE! I agree with that cons which you described above but mailchimp provides free service so why you expecting a lot in free service? BTW, thanks for sharing other tools here! I totally understand but in the point of view of an e-marketer, this is pretty bad. Personally, what’s the point of using an Internet marketing tool when you couldn’t even use it to its full potential? What you think about it? I find your tips by far the easiest to understand. I’m going to try out Mail Chimp simply because it is one of the options offered in SumoMe. Will give it a shot and let you know how it works out. Thanks for sharing some remarkable Email Marketing services which are indeed useful to build blog audience. Well right now i am using MailChimp, because it allows me to create a list of up to 2,000 email subscribers free of cost. That’s the reason I mentioned MailChimp into my list. A beginner to email marketing can try his hands on email marketing and list building without burning his pocket. But if you are serious about your blog’s readership then you must look for AutoResponder feature in your email marketing software which premium services like GetResponse provide. By using it, you can automate your welcome emails, promotional emails etc. What do you think about it? First of all Thanks Ankit for sharing nice comparison about email marketing services. I have one question, with MailChimp you says; “You can’t automate your newsletters with their free account.” Are you talking about RSS auto feed? Do let me know if you have any other query. @Ankit, Thank for the reply, I am using MailChimp for building my list. When successfully get 2000 contact, will go for GetResponse, as it has great features you mentioned in the post. @Usman, Thanks for the signup. I hope you will 🙂 I have planned to announce lucky winner at the end of this month. These are very good email marketing software. I’ve tried a few of them including constant contact and GetResponse. They’re good. I started using benchmark email recently and It’s nice I must say. Great interface and everything. Nice article, Thanks for sharing. As you have used both GetResponse and BenchmarkEmail, can you please share some major differences between both of them? What are your personal views on GetResponse Vs. BenchmarkEmail? but before that can you tell me “How much open rate and click rate you are currently getting”?. The think is my current email marketing service is like the hell of any service. it’s just useless. I am thinking to switch to any better service, i have 10K+ Subscribers, i am confused that if i can make even 10X of what i will invest on email marketing. I run a tech blog, what you think , give nay suggestion? PS. Really I like your blog, it’s a powerhuse of blogging related info. Keep doing the awesome job! I’m getting around 8% open rate and 6% click through rate. Please note that I use Segmentation to increase these numbers. What I personally think is these numbers depend on your audience. You might get a much higher open rate and CTR. You have a BIG email list. So, I recommend you to try GetResponse’s trial first before making any decision. After a long time, a very nice article you placed on BTT. This post would help to bloggers and new marketers to choose the right email marketing solution. You are right bro- GerResponse is good to use. One more reason for using it is – It offers landing page builder. So we needn’t moving anywhere else to build beautiful landing pages. Currently, I am using Mailchimp on my blog – Myquickidea. The reason is very clear as It’s free. I would also consider using GetReponse, once decide to go for a premium email marketing solution. Here one question pop up in my mind bro. I have noticed that you haven’t used content up-gradation in this post. IS there any particular reason or you do it for few specific kind of posts only? I use content upgrades only if I have something relevant to offer. Like in my Best Keyword Research Tools post, I am offering Keyword Research Guide which is highly related to the subject of the article. The more relevant your offer is, the more conversions you get. SIMPLE! If you can give me a good idea for Content Upgrade for this post, I’ll be happy to apply that. Do let me know if you have any other question. Once again right post at right time with Perfection.. You really HIT the nail with topic you choose. I have used most the ESP metioned in Top 5 apart from get Reponse and Active Campaign, and would surely give it a TRY; only thing i would like to know is do it provide feature like DRIP marketing and customized workflows? Alos, it would be great if you can share some insight on DRIP marketing .. As this is highly needed in today’s age to send right content at right time, as per my knowledge Mailchimp does a GREAT job with this feature! Very informative article you published 🙂 i have some confusion between GetResponse or MailChimp but finally i decide to buy GetResponse after reading your post. i am using the same but the problem is that cpc is very low..how to solve this problem.. my traffic is good but earning is only 100$ pm. In your niche, CPC will be low, Ritu. You can try targeting some high CPC keywords and target traffic from countries like UK, Canada. Hopefully, it will increase your earnings. Well Written! but i want to ask that is the Email marketing effect-able still. And there is a lots of fake email ids, how can we recognize that this email is correct and can we design a content for Email with these tools? If you use any premium tool like GetResponse you’ll get so many advanced features. You can easily protect your list from spam emails by using Double-optin feature. It will add only confirmed email addresses into your list. There are so many professional designed templates you can use for your emails. Not only that, you can design your own templates too. Isn’t awesome? Try GetResponse for 30 days for FREE and you’ll love it for sure. Frankally I am struggling with the mailing list of my blogger. Your tips helped me a lot. ty for sharing it. So which email marketing service you are going to try, Ravi? Ankit, I recently started using MailChimp. No doubt, MailChimp is a good option. Great choice. I just checked your blog and noticed that you are promoting Aweber. Have you personally tried it? I was using it in past then later I switched to GetResponse. According to my personal experience, GetResponse is much better than Aweber. What are your thoughts on it? And if you have anything valuable to share that can add value to my article, then please share. Your contribution will be appreciated. Hi, I recently started blog and I am in confusion that how to start online promotion. I searched for that and I got your article. It made me clear. I learned how important Email list is. I hope this article will help people out there who are new to blogging. Thanks. Is there any plugin for wordpress I use Genesis Framework theme, so I remember HelloBar which provides subscription service including popup for Facebook likes. Are you aware of any plugin for my hosted blog, it would help me start build list of subscribers ASAP. Thanks for list of email marketing s/w! The one plugin I use and recommend for list building is Thrive Leads. It is the best list plugin I have ever come across. Give it a try and grow your list. Thank you, will try it! Hi Ankit. Nice post. I’d love to share a new combo I am trying myself and for my clients recently – MyMail WordPress Plugin + Amazon SES integration + Ninja Popup WordPress plugins. This combo brings down the cost abruptly. You are paying one time for the plugins on Themeforest. After that you pay 0.10 USD per 1000 Emails to Amazon. No monthly subscription fees for Email sending like you are paying for GetResponse, ActiveCampaign or Mailchimp, nor for lead capture toola like SumoMe or OptinMonster. Though these plugins are not as advanced or user friendly as the premium services, but the optin % or Email open % can give these premium tools a serious competition. I’d love to get your feedback if you or anyone from your community test this combo. Thanks a lot for sharing this combo. It’s a great idea. As of now I’m using GetResponse + Thrive Leads WordPress plugin for list building and it’s working great for me. Because of some awesome features of Thrive Leads plugin, I can’t stop using it. But your idea is nice and I’ll definitely give it a try on my other blogs. Great post as always Ankit. One question if you can explain in simple wording is what is A/B testing and what is its importance. I’ll try GetResponce.Thanks again for the nice information. A/B testing (sometimes called split testing) is comparing two versions of a web page/landing page/emails etc. to see which one performs better. You compare two web pages by showing the two variants (let’s call them A and B) to similar visitors at the same time. The one that gives a better conversion rate, wins! Do let me know if you need any other help. You’re doing a great job and inspiring me to blog with passion. I would say that it is an exclusive post for the bloggers that reveals the importance of Email marketing. I’m yet to start building my email list with any of these reliable email marketing services which you have listed here. I have seen that the most of the bloggers use MailChimp and GetResponse and yes, GR seem to have a great autoresponder. I wish to customize a distinctive Email newsletter for my beloved readers, so which one would you like to suggest for me, bro? Recommend the best service, I’ll go with you. Thanks for sharing the incredible details for the dedicated bloggers, keep doing your great work. If you start building an email list for your new blog (WPGlossy) from now, it will give HUGE benefit in the future. MailChimp and GetResponse both are my favorite email marketing software. You can go with any one of these. Also, it depends on your needs as well. If you just want to send blog post updates with the custom message, you can go with MailChimp. But if you are looking for a professional email marketing service which can allow you to send promotional emails and provide you a solid autoresponder, I highly recommend you to go with GetResponse. As it is a paid service, in the beginning, you will feel that you are wasting your money on this. But keep using it and keep building your email list. Trust me; it will be your best investment. Once you’ll have a HUGE email list, with just a single promotional email, you can make decent affiliate income. Do let me know if you need any help in this. I hope your readers would love to know about my article. Kindly do let me know if you find it worth mentioning into your article. I have read so many post on email marketing and learnt that having mailing list of readers can derive more traffic than any other thing.But I didn’t find very good review of which tool should i start email marketing with.So i started with mailchimp for learning more about this topic so that in future when my mailing list increase i move to awber which i think is very good. Thanks for Information about Email Marketing Software. Your Article is impressive and very informative. I am now regular visitor of your website and bookmarked it. I tried some of the email tools but your article of email Marketing based Software. I’m definitely going to try these software. Really nice and very informative,now I’m regular user of your website. Mailchimp is my all time favourite email marketing tool, in starting of my blogging career you helped me a lot and that time you also suggested me about mailchimp . Here you have shared awesome all kind of necessary things before publishing a e-mail to followers . Split testing is very important i learnt this method from you . BTW this is fantastic Guide for all bloggers and internet marketers. sir, This is graet article, I love your website. I am big fan of your post. thank you for such a great post on email marketing, i am just about to start my new blog, which will you recommend me? Get Responsive or mail chimp? I am about to buy a premium subscription for Getresponse. I would like to know if you have encountered any other problems with Getresponse. I’m the Founder of MasterBlogging.com. I am a Professional Blogger, Affiliate Marketer, YouTuber, Consultant, Trainer, and a Public Speaker. I’ve been blogging since 2008 and making a living from my online businesses. Master Blogging is your go to resource to not just learn but MASTER the art of Blogging. One place for lots of Blogging tips, techniques and strategies that work. © 2019 MasterBlogging - Master The Art of Blogging! Ready to follow blog post structures from Introduction to Conclusion. 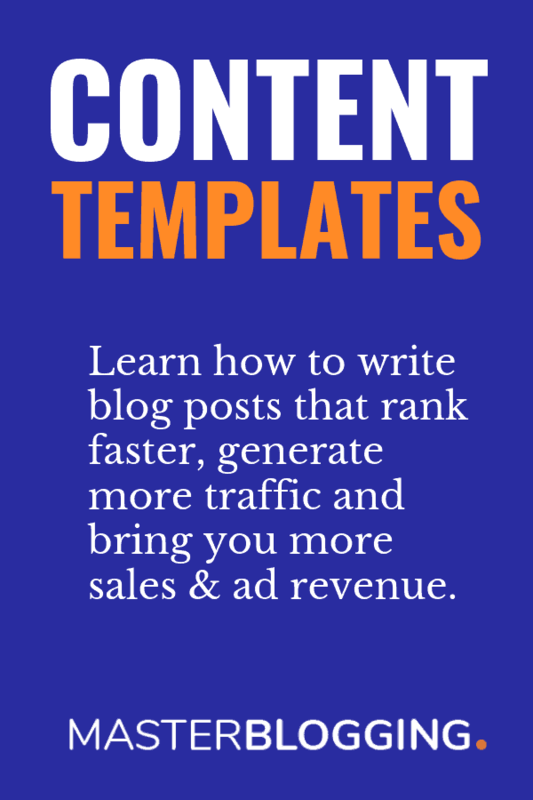 Where should I send your Content Templates? Send it to my inbox!